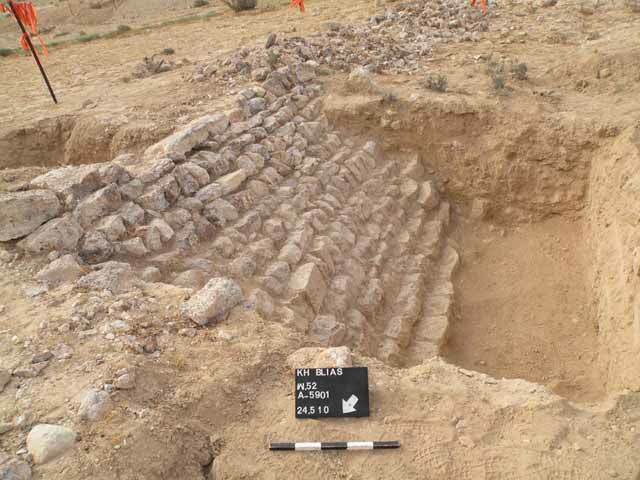 During April–May 2010, an excavation was conducted close to Khirbat Bulei‘is (Permit No. A-5901; map ref. 185530–956/551633–786), prior to the construction of an IDF training campus. 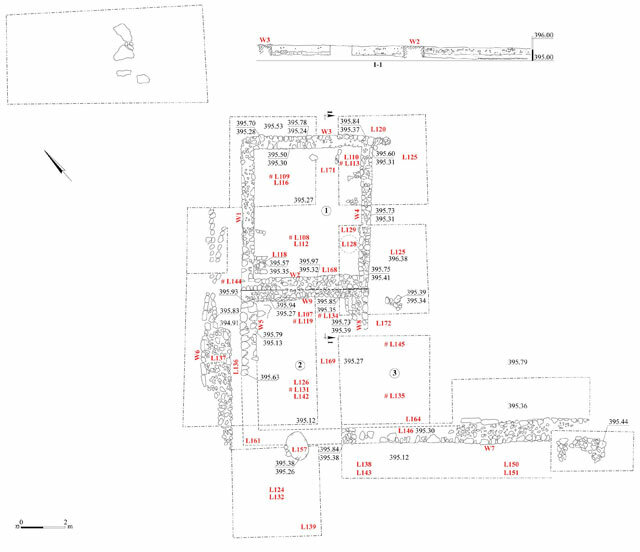 The excavation, undertaken on behalf of the Israel Antiquities Authority and underwritten by the Ministry of Defense, was directed by I. Peretz (Areas B, C, D supervision; field photography), with the assistance of N. Shaul (Area A supervision), Y. Radoshkevsky and A. Pilin (area supervision assistants), Y. El-Amorr (administration), M. Kunin, A. Hajian, T. Kornfeld and B. Antin (surveying and drafting), Sky View Company (aerial photography), P. Fabian (guidance and metal detection). I. Berin (final plans), L. Kupershmidt (metallurgical laboratory), C. Amit (studio photography), Y. Gorin-Rosen (glass) and C. Hersch (drawing of finds). Khirbat Bulei‘is is located c. 9 km northwest of Yeroham. The excavation area was 1.8 km southeast of the Negev Junction, and 30–50 m north of Khirbat Bulei‘is. The ruin is situated on a low plateau of limestone and flint outcrops, which descends northward and is crossed by tributaries of Nahal Sekher. At the end of the 1970s, the ruin and its surroundings were surveyed within the Survey of Israel (Map of Mis‘af Negev , Site 160/51/5) and a large farm building was documented. A survey prior to development was performed in the vicinity of the ruin in 2004 (Permit No. 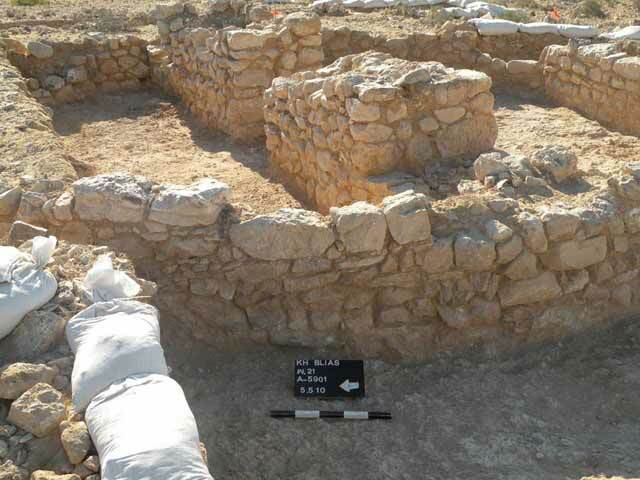 A-4221) and an excavation was carried out on a farming terrace in Nahal Sekher in 2008 (HA-ESI 123). Four areas (A–D; Fig. 1) were opened. Area A consisted of twelve squares (242 sq m) and a building and two walls were excavated. 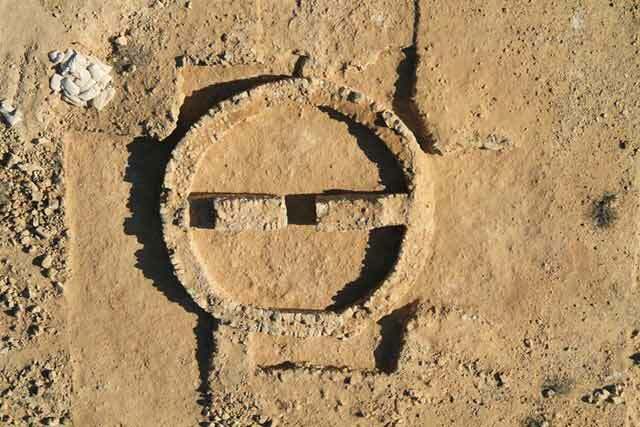 Nine squares (158 sq m) were excavated in Area B and a circular building was exposed. Three squares (41 sq m) were excavated in Area C, exposing farming terraces and an enclosure wall. 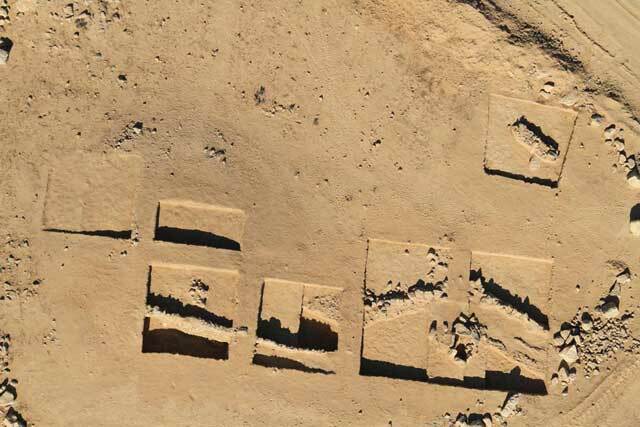 Eight squares (126 sq m) were excavated in Area D, revealing two farming terraces and wall remains. The finds recovered from the excavation dated to the Late Byzantine and the Early Islamic periods. Area A (Figs. 2, 3). 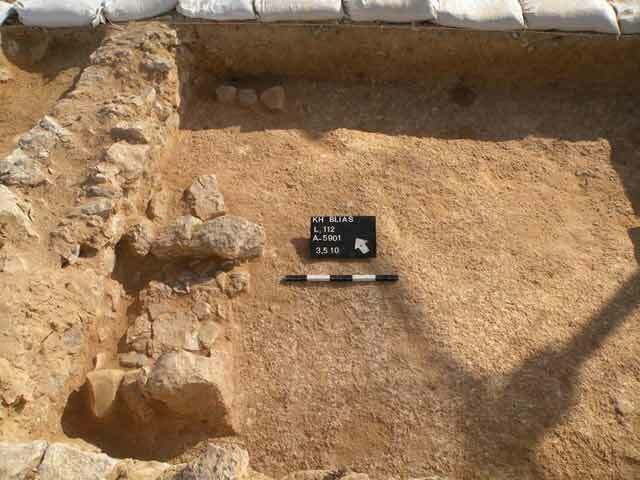 Collapsed lime and flint stones, as well as walls, were discerned on the surface prior to the excavation. 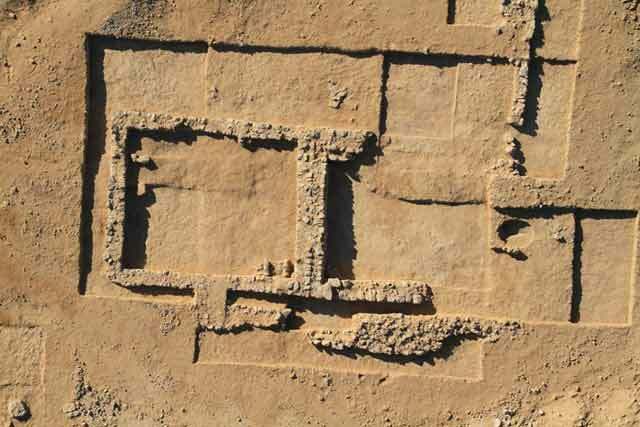 Remains of a structure were exposed in the excavation; it included two or three rooms that were built in two phases. The northern room (1; 5 × 6 m) was constructed in the first phase. Its walls (W1–W4; width c. 0.6 m), founded on hard, dark brown soil that contained calcareous clusters (L112, L116) and preserved two–five courses high (0.4–0.6 m), were built of two rows of partially dressed limestone, flint and different size fieldstones, with a core of small stones that were bonded with loess-based mortar. The floor of the room was loess mixed with ash (L108–L110, L113). An installation (L118; 0.6–0.8 m; Fig. 4) was exposed next to W1, near the western corner of the room. It was built of two rows of flint and limestone fieldstones that enclosed a floor of stone slabs. A hearth with burnt stones was discovered near the southern corner of the room; it contained a silver foil from a cigarette pack—a modern disturbance (L128). Another room (2; 4.2 × 6.0 m) was built south of Room 1 in the second phase and it seems that Wall 7 was also built at this time. The assumption that Room 2 was built later than Room 1 is based on the fact that its northeastern wall (W9) was constructed from one row of stones that rested up against Wall 2. The walls of Room 2 (W5, W8, W9) were built of two rows of stones, some partially hewn and some large fieldstones, with a core of small stones that were bonded with loess-based mortar. Several walls of this room were not preserved. Walls 5 and 8 were preserved two–three courses high, whereas five courses (height c. 0.5 m) had survived of Wall 9. The loess floor of the room had patches of ash (L119, L131, L134) on top of it. The walls and floor were founded on dark brown soil that contained calcareous clusters (L142). The building may have included another room (3; presumed dimensions 9.6 × 14.0 m) that was delimited by two walls (W7, W8). Wall 7 (width 0.6–1.2 m), whose construction resembled the rest of the walls of the building, was built of two rows of stones with a core of small stones; it was preserved two courses high (c. 0.4 m). The floor of Room 3 (L135, L145) was similar to the rest of the floors in the building. An ash pit (L157), located along the presumed line of Wall 7, was discovered in the southwestern part of the area. A level of loess mixed with ash (L132, L139) was uncovered south of the pit. Northwest of Wall 5 was a large stone heap (L137), probably collapse from the walls. A habitation level that contained numerous chunks of charcoal (L144) was exposed below the collapse. This level may indicate that the building included other rooms toward the northwest that were not preserved. The finds in the building and on the surface level dated to the Late Byzantine and the beginning of the Early Islamic periods (sixth–eighth centuries CE) consisted of a few fragments of pottery vessels, including bowls (Fig. 5:1, 2), a cooking pot lid (Fig. 5:3), jars (Fig. 5:4–8), a jug (Fig. 5:9) and a flask (Fig. 5:10); stone objects that included a basalt grindstone (Fig. 5:11), a small conical limestone (Fig. 5:12) and a semicircular black round stone (weight? ; Fig. 5:13), as well as fragments of glass vessels. Area B (Figs. 6, 7). A circular structure (inner diam. 5.5 m) was exposed. It was built on the bedrock of two rows of roughly hewn stones of different dimensions and small fieldstones, with a core of small stones bonded with loess-based mortar (W21; width 0.8 m; Fig. 8); most of the stones were flint and a few—limestone. The structure was preserved six courses high (c. 0.81 m). Two walls (W22, W23; width 0.8–0.9 m) that divided the structure into two rooms (L207, L212) were built in the middle of the building. The construction of Walls 22 and 23 was similar to that of W21, and they survived seven–nine courses high. The floors of the rooms were leveled loess atop the limestone bedrock (L217, L218). Stone collapse and stone slabs from the ceiling of the building were discovered on the floors. A small concentration of ash was uncovered above the floor of the southern room. 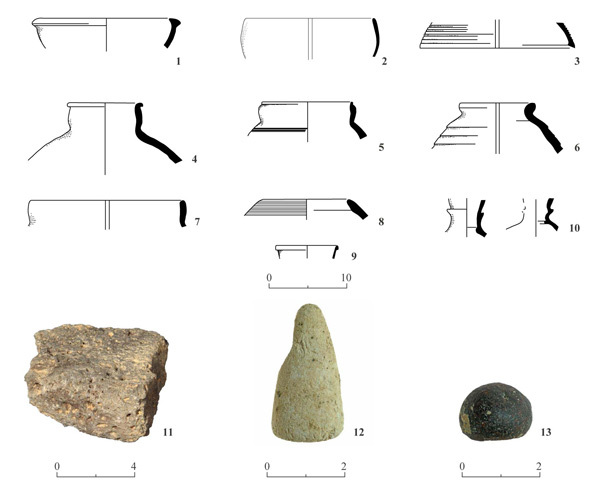 The finds in the building and outside it included a few fragments of terracotta pipes from a dovecote (Fig. 9) and body fragments of bag-shaped and Gaza jars that dated to the Byzantine period. Based on the ceramic pipes, it seems that the building was used as a columbarium; it may also have functioned as an observation tower. 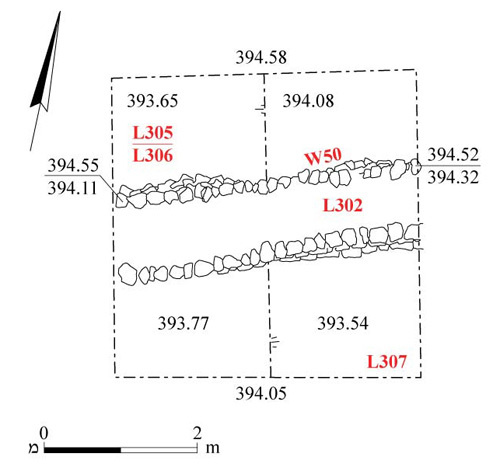 Area C. A probe trench was excavated near a wall (W50; width 1.0–1.4 m; Fig. 10), south of the wadi channel. The wall was built of two rows of limestone and flint bonded with loess, with a core of loess and small wadi pebbles (L302). Some of the stones were medium-sized and roughly hewn, mostly at the base of the wall, and some were small fieldstones. The wall was preserved four courses high (c. 0.44 m). Soil fills (L305–307) that contained a few body fragments of jars from the Byzantine period was discovered north and south of the wall. 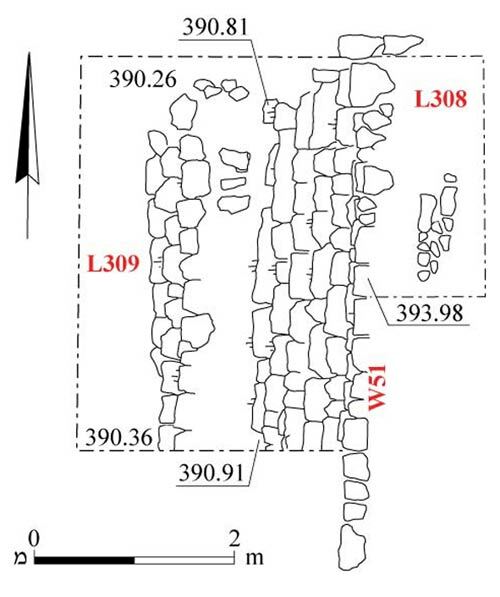 Farming terraces are visible in the wadi channel, and two segments of terrace walls (W51, W52; exposed length 4 m) were revealed in the excavation. The two walls were built of flint and limestone in a stepped fashion, descending toward the west. Some of the stones were roughly hewn and some were fieldstones bonded with loess mortar and small stones. Wall 51 (Figs. 11, 12) was composed of two parts. The bottom part was broad and included three stepped courses (width 1 m, height 0.56 m), while the upper part included seven stepped courses (width c. 1.2 m, height 2.17 m). The upper part was not built directly above the bottom part, but was set inward, c. 1 m to its east. Wall 52 (Figs. 13, 14) was preserved fourteen courses high (c. 2 m). Loess alluvium and a few stones, with no datable finds, were discovered east and west of the walls. Area D (Figs. 15, 16). Farming terrace walls (W76–W78, W80) and a segment of a curved wall (W81) were uncovered. Terrace Wall 76 was exposed in the southern part of the area (length 8.6 m, width 0.3–1.0 m). It was built in a stepped fashion and descended to the east. The wall, preserved six courses high (c. 0.83 m), consisted of fieldstones, mostly different size flint stones, bonded with loess-based mortar. Eroded loess soil and a few body fragments of pottery vessels were discovered near the wall (L403, L408, L410, L415, L422). Near the base of W76 (L412), a few body fragments of jars, olive pits and a narrow strip of ash were found. Walls 77, 78 and 80, in the north of the area, were part of a complex of farming terrace walls. They were built in a gentle stepped fashion, descending west. Wall 80 (length c. 3 m, width c. 0.4 m), preserved a single course high, was built of small flint and limestone fieldstones, bonded with loess-based mortar. 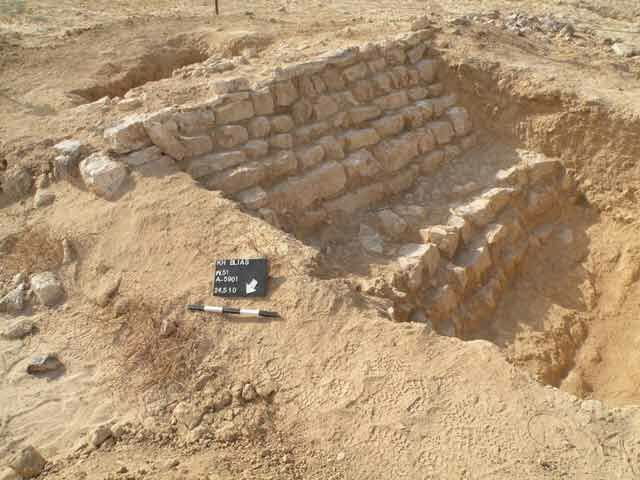 A rectangular installation, built of two courses of medium and large flint and limestone fieldstones (L405; 1.6×2.0 m, height 0.48 m), was incorporated in the southern end of the wall. The installation may have been used to direct the flow of water. A tamped layer of loess (L409), devoid of finds, was discovered east of W80. A level of stones without finds (L406) that extended west of W80 to as far as W77 was revealed. 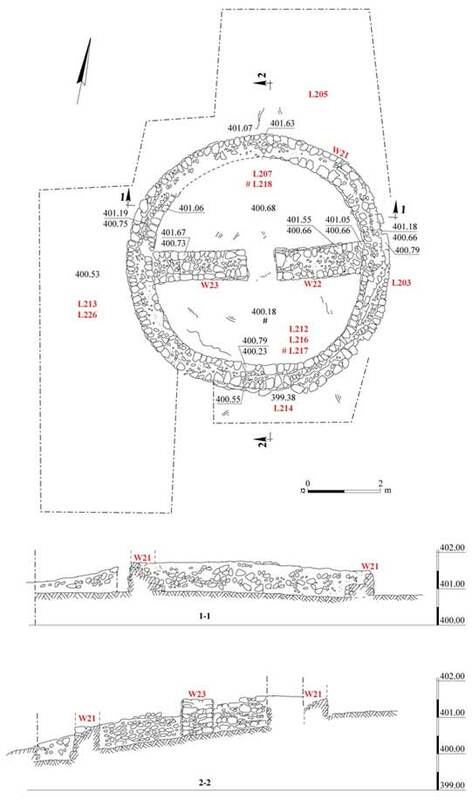 Walls 77 and 78 were segments of the same wall that curved slightly (length 8.6 m, width 0.6 m). This wall was built of a single row of different sizes fieldstones, mostly flint, which were bonded with loess-based mortar and preserved seven courses high (0.63 m). The stone and soil collapse (L420) that was removed above W77 contained a rim of a bowl or cup (Fig. 17:1), as well asfragments of jugs from the Late Byzantine and Early Islamic periods (Fig. 17:2, 3), a small body fragment of a metallic vessel and a small bone of a rodent. A level of small stones (L407) was exposed east of W78. A similar level of small stones was exposed west of W76. Wall 81 (exposed length 2.2 m, max. width 0.6 m), in the northwest of the area, was curved and built of different size flint fieldstones, bonded with loess-based mortar and preserved three courses high (0.56 m). The excavation was conducted in the agricultural areas of Khirbat Bulei‘is, which is dated to the Late Byzantine and the Early Islamic periods. Two construction phases were discerned in a building in Area A; it is possible that the structure was first used as a watchman’s hut and later, was enlarged to serve as a farmhouse. 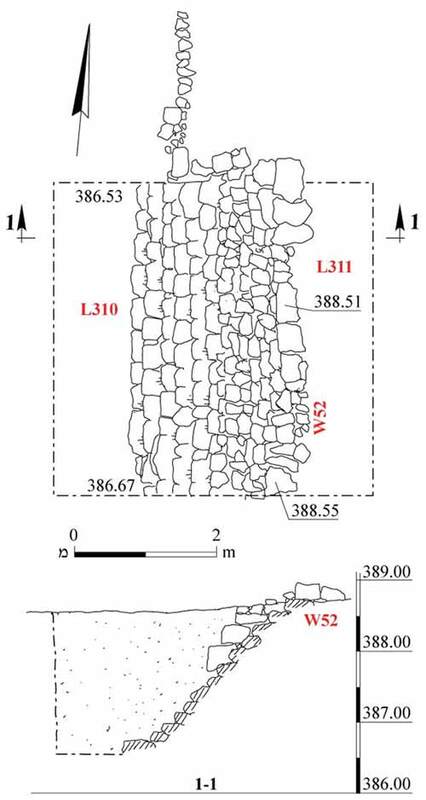 It seems that the farming terraces in Area C were related to the habitation in the building. Wall 50, to the south of the stream, was probably used to delimit a cultivation plot or to divert water from the ruin and the hill eastward to the plots in the stream. The building in Area B was probably used as a columbarium and an observation tower. Stepped farming terrace walls were exposed in Area D; the stepped orientation shows the direction of the stream flow.Walls 77, 78 and 80 were built in a channel that flows from east to west, whereas Wall 76 was built in a channel that flows from west to east. It seems that the subsistence of the residents was based on growing crops and raising doves, similar to that of the Shivta residents (Hirschfeld Y. and Tepper Y. 2006. Columbarium Towers and Others Structures in the Environs of Shivta. Tel–Aviv 33:83–116) and Horbat Sa‘adon (Y. Tepper, per. comm. ), where buildings for raising doves were excavated and documented. 1. Map of the excavation areas. 2. Area A, plan and section. 3. Area A, aerial view, looking southeast. 4. Area A, Room 1 and the installation, looking northeast. 5. Area A, pottery and stone objects. 6. Area B, plan and sections. 7. Area B, aerial view, looking north. 8. Area B, circular building, looking east. 10. 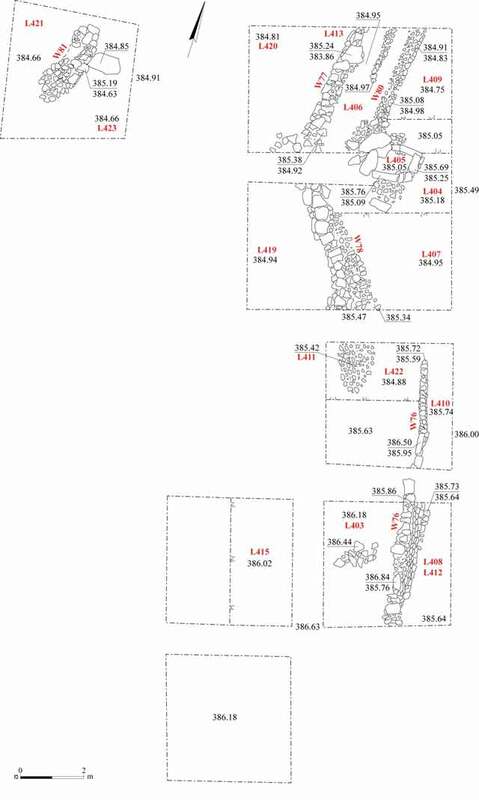 Area C, Enclosure Wall 50, plan. 11. Area C, Farming Terrace Wall 51, plan. 12. Area C, Farming Terrace Wall 51, looking south. 13. Area C, Farming Terrace Wall 52, plan and section. 14. Area C, Farming Terrace Wall 52, looking south. 16. Area D, aerial view, looking west.